If when you close your eyes and can hear the shrill call of the mighty bald eagle. Or if you ride a Harley and want you lid to embody the same esprit de liberté that you feel between your legs. 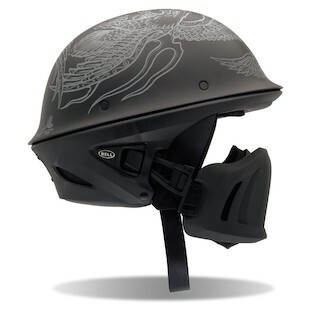 Or you are just a righteous badass that needs a helmet to match your tattoos and lawless soul, then the Corey Miller edition of the Bell Rogue is the helmet for you. Adorned in some of Mr. Miller’s finest work, this Bell Rogue Corey Miller War Eagle Helmet is certainly for those who Live to Ride and Ride to Live.